The pentacle was once revered for the perfection with which the human form fits enigmatically into a five pointed star. Today it is a symbol that resurfaces time and again, but without the purity that was originally intended to be its message. The ‘evolved’ and altered image shown here is all that has survived human interference over the ages. Few if any have given any thought to its origins. I believe that before this symbol was usurped by all kinds of bizarre followings, it was the ultimate representation of humankind. Humankind, whom he believes from all my research, came from the stars so to speak! Humankind created under a supreme Creator’s perfect mathematical design code. So why has this symbol of perfection been so blatantly confused with evil? Why has a unique representation of this symbol become the object of desecration and Satanism, to be feared when it was once so pure? The story of the universal mathematical blueprint of the human form seems to originate around the time of Christ. A man by the name of Vitruvious lived during this period. We all know how Da Vinci referred to this ancient scholar in his rendition of ‘Vitruvian Man’. What most people don’t realise is that Vitruvious not only delved into advance drawings and the mechanics of machines like Da Vinci, but he had originally represented a universal mathematical code of the human form that was once more defined. 2000 years ago, Vitruvious had recognised the navel as the important central axis for a circle and a square when the human form has legs together and arms outstretched above the head. He also had a second rendition of the human form with legs and arms apart. But here is where something crucial seems to have been forgotten or intentionally omitted. Vitruvious originally interpreted the arms quite differently to Da Vinci in two distinct positions with arms outstretched above the head and arms outstretched far apart. (matching the exact leg positions being together and far apart). This is exactly how I have interpreted the two arm positions in my human codex theory in ‘The Hidden Records’. Da Vinci thought the point where the square and the circle intercept was a sacred arm position (see position ‘x’ in the image below). It is also amazing that while Da Vinci published his perhaps ‘censored’ Vitruvian man 1500 years later… another great scholar in Germany at virtually the same moment in time as Da Vinci published the complete Vitruvious human form rendition. His name was Heinrich Agrippa. The churches in Germany were so horrified by this mans occult publication that he was arrested and subsequently burned at the stake. Here is a combination depiction of Agrippa’s reproduction of Vitruvious’ 2000 year old human code and his two original sketches are shown in an overlay. Note the ‘all seeing’ eye positioned above the head like a crown. It suggests that Vitruvious himself might be repeating an ancient Egyptian source of lost knowledge. One must also consider the possibility that it was not at all safe 2000 years ago for Vitruvious to show the once sacred human icon as complete, i.e. the connection between the human form and the stars. Over time, the true meaning of the once sacred icon suddenly became embroiled in witchcraft during the Renaissance era, and was henceforth interpreted as ‘the occult’. The ‘sacred’ symbol became a target for desecration by evil groups and cult followers. The way to show disrespect for its godliness and purity was simple… it was unceremoniously turned upside down and desecrated in rituals and utterances, perhaps motivated by the intention to scare people away from the wonderful 'secret'. The icon became something churches believed should be feared. And fear one must, but for other reasons: Humanity has taken our most precious icon of whom we are and where we come from and violated it. 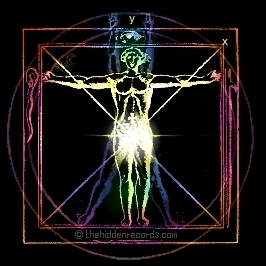 Once you have had the opportunity to read 'The Hidden Records', you will notice that the symbol above has evolved from a very sacred codex that not only makes its appearance at Stonehenge and Giza, some of humanity’s oldest sites, but as bizarre as it may sound, it can even be found on another planet. To get an idea of what the author is getting at, browse through the thumbnail images on this website, then go to the book for the all important reasoning. This is how the author believes this sacred symbol became distorted. It would appear that over time the human genitalia were seen to be a more appropriate focal point of the ‘star man’ than the navel (as in Da Vinci’s Vitruvian Man), which was once the central point from where all the geometrical proportions emanated. It is not surprising this distortion of the original came about. 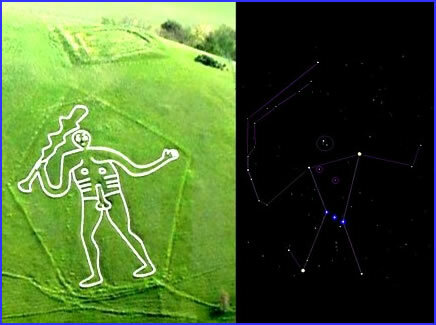 In the case of the age old Cerne Giant found at Dorset (shown lower down), it seems the genitalia form the cosmic pointer to the area of the sky that repeats the solution to all the star maps that have been found by the author. 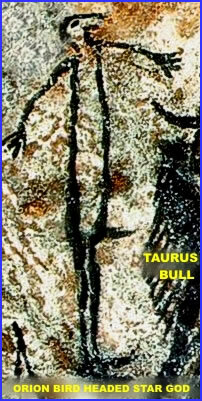 The same is true for a similar painting of a man in the Lascaux caves that dates back 17 000 years, where the human anatomy acts as a cosmic pointer to the celestial bull. In both instances the genitalia have mistakenly been confused with the ‘sacred geometric centre’ of the human form… hence the distortion of the meaning of the pentacle in later years. The answer to the question is that there are two distinct interpretational themes and the author has only recently been able to reason why this is so. The book goes predominantly into instances where pure geometry is prevalent, with precise 45, 60 and 90 degree angles. He verifies these angles that make up the human form with an experiment measuring my own dimensions. In the less detailed examples, all that is of relevance to the author is the prevalence of the all important unique elongated pentagon. It would seem that the way in which disparate civilisations around the globe once depicted their embodiment of the human form varies from one to the other. I believe the pure geometry was either forgotten or intentionally hidden. In the more recent case of Leonardo Da Vinci, I would like to point out that he may strategically have hidden the easily recognisable pure angles of 45, 60 and 90 degrees in a 'sketch' version of what was to become known as his famous ‘Vitruvian Man’. I believe this could have been to avoid repercussions from the church for being so outspoken. On the other hand, the dimensions may have been quite variable. In reality all human beings display variations on the dimensions of the human form. This being the case, the dimensions will generally come close to the pure angle hypothesis, but not necessarily emulate it exactly. Many have also suggested the face of Vitruvian Man is Leornado Da Vinci himself! Firstly, in what I define as ‘pure’ form. What comes to mind here, are megalithic architectural layouts, depicting precise geometry, made up of three equilateral triangles from the navel, as well as two right angled triangles with 45 degree angles. The author confirms the accuracy thereof in an experiment using the measurements of my own ‘human codex’, coincidently turns out to be identical to the codex found in the Cydonia area on Mars. Secondly, in what he loosely defines as a ‘general’ portrayal. Here, the human form is depicted inside a rough sketched or simple elongated pentagon that has no clear ‘pure’ angle geometrical make-up. An example of this can be seen in the landscape renditions below and in the famous sketch of Leonardo Da Vinci’s 'incomplete' Vitruvian Man. Both variations – the one with its exacting angles, the other with its ‘simplistic elongated pentagon’ – are important in deciphering the validity of the author’s hypothesis and it would be absurd to argue over the variances. I believe that in all likelihood Da Vinci would have put his life at stake had he dared to portray his Vitruvian Man in ‘pure’ geometric form with the arms depicted in the overhead position (as seen on this website). This would have been synonymous with a star in a circle. Exposing such ‘sacred’ knowledge, which Da Vinci inadvertently seems to have had access to, could well have cost him his life. Five sided pentacles inside circles, and similar renditions, were taboo in the Renaissance era. The author believes that the church of the day was aware of the threat that this revived ancient knowledge might pose. The holy books did not seem to mention it, so perhaps many deduced that it therefore had to be untrue. Could this human codex once have been part of the original texts of our holy books before the Renaissance era? Knowledge that ties humanity with ancestors that came from another star system! Knowledge that would suddenly be incriminating to the church! This begs the question: Was it deliberately omitted? Or did they know about the validity of these teachings, but realising it was a threat to religion, decided it had to be relegated to a secret. It would have been an almost impossible task to reincorporate this lost knowledge in the holy books at a later stage. The church of the time would no doubt have feared the loss of its credibility if critical changes were suddenly made to its holy books. The only way to prevent scholars researching such controversial material was to declare it taboo! Depictions without ‘pure’ angles are far more prevalent, their relevance being ascribed to the uniquely elongated pentagonal shape in which the human form is ‘contained’. This elongated pentagonal shape in its simplicity is still quite unique in nature. 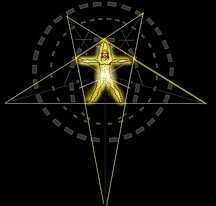 There is nothing else that fits the shape so aptly other than the human form when it is mimicking a five pointed star. 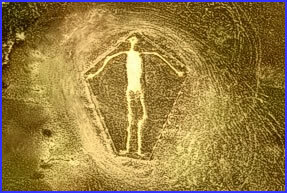 As insignificant as the above ‘sketch’ of a naked man on a hillside in Dorset (south of Stonehenge) may seem, it was exactly this phenomenon that inspired much of my theory on this complete ‘geometrical man’ and its subsequent implications in a much bigger picture. He wondered if this five-sided representation of the human form could fit into the shape of the five trilithons that make up the circle at Stonehenge. The mythology and folklore associated with Stonehenge has always suggested that this mysterious stone circle holds a secret about humankind itself. So finding a theme to do with the human form not too far from it, suggested to me that Stonehenge and the so called ‘Dorset giant’ could somehow be linked. The image above is the latest associating breakthrough that really makes the Dorset man fit. Recently, New Age researchers have suggested over the internet that this ancient deity appears to be a representation of Orion! I believe this finding goes hand in hand with my greater star map theory, and the cosmic 'pointer', which is so integral to my findings. Not only does the Cerne Giant of Dorset contain the breakthrough elongated pentagon, but it further corroborates some of the author's other research. 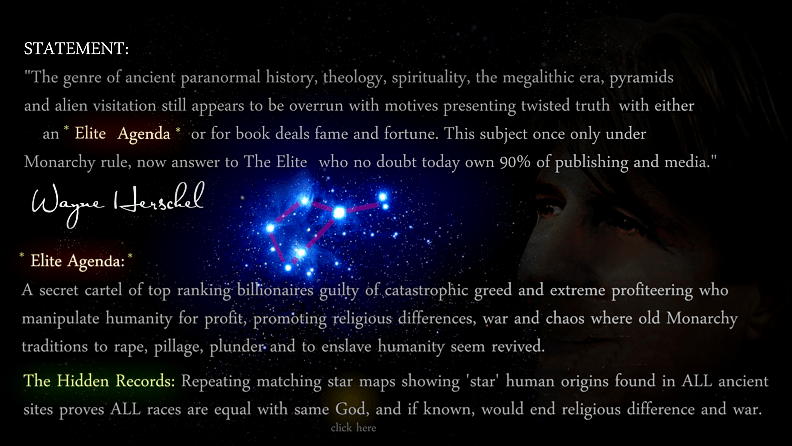 Namely, that Orion is the 'cosmic pointer' to locate the position of the sacred star, around which my book revolves. It may not necessarily be Orion’s 'belt' that is pointing the way to something important in the heavens, but another part of the man's anatomy! Ancient scholars passing this information on from one to another would surely not have forgotten such a unique teaching mechanism. Proof supporting this bizarre interpretation can be found on page 165 of ‘The Hidden Records’. On the border between Arizona and California, three independent human form geoglyphs have been etched into the landscape next to the Colorado river. They are very ancient and were without doubt inscribed by the earlier American Indian people that once lived there. Or if you are fortunate to live near this area: drive about 20 miles north of Blythe in California along the Colorado River. Follow the water North to a point where homes dot the riverside. You'll see State signs marking the road to the sites. From there, go west a short distance to a group of small hills by dirt road. 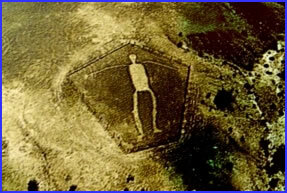 They have been named ‘The Intaglios’ and have been created by the identical technique used in the Nasca geoglyphs in Peru. In the two images below, an idea of the size of these landmarks can be indicated by the size of the fence built around the now protected geoglyphs. What extraordinary set of circumstances would inspire the ancient people to create the images of three naked human depictions with outstretched arms in this way? What is worth reasoning now is: Firstly, whether the human form with arms outstretched inside an elongated pentagon, appearing in four very large landscape renditions (three in California, one in Dorset) is purely coincidence? And secondly, for what reason would the renditions have been portrayed so large, facing skywards? 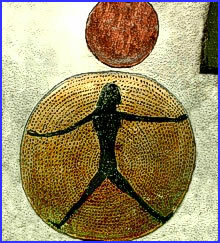 At one ‘Rammeside period’ tomb in Egypt there is a cosmic mural with a similar portrayal of the human form with arms and legs outstretched, contained inside a circle. The man’s head is ‘crowned’ with the sacred solar disc (or sacred Sun-like star as debated) so often seen in Egyptology, and which the author strongly believes is the star of the ‘gods’. To add to this reasoning, a whole array of stars, shown as small dots, can be seen inside the disc. One could surmise that it suggests that the solar disc and the cosmic man are found near the edge of the myriad of stars of our galaxy we call the Milky Way. There are two very ancient symbols – the first two here (from left to right) are both of sacred geometry – identified by the author as having been found at Stonehenge. In both instances the human form is shown upright ‘mimicking’ a five pointed star! 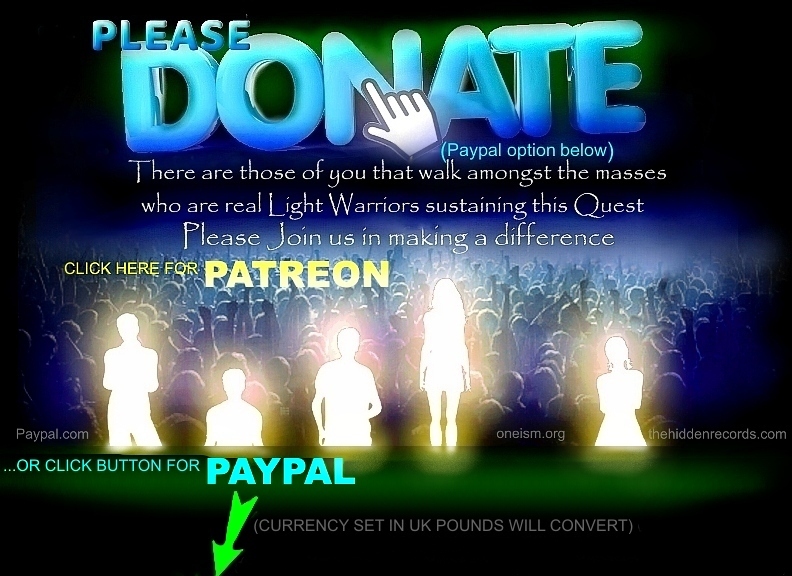 The image on the far right is the simplified version of the five pointed star with a circle. Today the meaning of the pentagonal inner shape with its equal sides has been completely forgotten. Notice that the star is ‘upright’. In instances of the human form being shown ‘upright’ (as in the symbols above derived from Stonehenge), this is indicative of the goodness of a constructive God’s creation… hence a sacred human codex. The image in the centre is a complete version of the pentagonal geometry found at Stonehenge. When compared to the images and symbols that follow below (which are ostensibly associated with evil), it is quite obvious how the meaning of this ‘sacred’ geometry became distorted and confused. One important breakthrough I made since publishing my book is that the geometry at Stonehenge also appears in the secret geometry associated with the legendary King Solomon, but this is a long story on its own. In more recent times, the pentagonal symbol that makes up Stonehenge is exactly what the military and law and order in the United States use as their badge. Is this merely a coincidence? Evil destructive societies throughout history have found a way to desecrate the sacred symbols (shown above) associated with the human form. The opposite of good and purity is achieved when the symbols shown above are depicted upside down, as seen below. What has happened is that their meanings have been totally confused over time, deliberately in some instances, unwittingly in others. In all fairness, there are innocent cases of artists and builders of modern structures over the last few centuries getting these symbols completely mixed up and unknowingly reproducing them in their derogatory form. The symbol in the centre (shown above) completely mocks the original sacred symbol by showing the human form upside down and hence dishonouring God’s creation of humanity. Shown on either side of this symbol that has become associated with evil, are more recent derivatives, entirely devoid of the original geometry, and hence the honourable intention of the symbol’s original meaning. At some stage the symbol was associated with a goat head being superimposed over the original geometry, and is now used by Satanic groups and blood fetish cults. The author disassociates himself completely from the three symbols shown above in red (or any practises associated with them). For me they decry everything my research stands for, namely the revival of pure and constructive ancient knowledge. I believe they are fundamentally and conclusively against the God-created gift of life, and the beauty of the uniqueness associated with the human form. There are already places in this world, where the red symbol’s meaning has become a reality and society is not even aware of how destructive it is. Human life is no longer regarded as sacrosanct, thus undermining the very reason for our existence. I believe the time is very near where those who are spiritually weak and without this critical knowledge, risk being caught up in the lure of these destructive forces. For those who feel a calling to the truth, please spread the news to disseminate this ancient knowledge and stand your ground against a pervading evil.